NYC Educator: Where Are the Brooklyn Queens Days of Yesteryear? This is the day when teachers in Brooklyn and Queens hold fond memories of Brooklyn Queens Days past. It was the best holiday in the whole world. No one knew what it was about. Sure there were stories, but they were contradictory and incomprehensible, and no one cared what they were anyway. You didn't have to travel. There was no cooking. You didn't have to buy gifts for anyone, and no one asked you to do anything. Most of all, you didn't have to go to work. Teachers in Manhattan, the Bronx, and Staten Island did, of course, and that made it all the more satisfying. Sure, they hated you and everything you stood for, but while they were crawling out of bed at the crack of dawn you were sleeping in, and contemplating where you'd be going to breakfast. Pancakes, maybe? Those ones with all that stuff on them that you wouldn't have time to eat if you were commuting to work? Or should you just sleep until lunchtime? Decisions, decisions. But then came the 2005 contract, the one that was the bestest ever (kind of like the one that's bringing us that fabulous 2% raise), and just like that, Brooklyn Queens Day, the best day of the year, was gone forever. In its place were a bunch of meetings, PDs, and who knows what else? Tell the kids they shouldn't be late, because being late is bad, and that's not good, and therefore you should fail them. It will teach them a valuable and indispensable lesson. Is that clear? OK, now let's talk about how we can pass absolutely everyone without exception no matter what. Does that test grade really have to count? Can't you just have them take it again after you've reviewed it? What if you pair the kids who don't know the answers with those who do? And remember all those domains we made you memorize last year? It turns out that most of them were a waste of time. Yes I know we said they were vital, and that you couldn't possibly be a good teacher if you didn't do these things, but it turns out they're of no relevance whatsoever, and you just voted for a contract affirming that. So this year we're gonna work on these, because these are the only important things in the world, and they will never, ever change. Yes I know I said that last year, but this year I really mean it. Don't question me like that. I refuse to admit it doesn't make any more sense to me than it does to you. 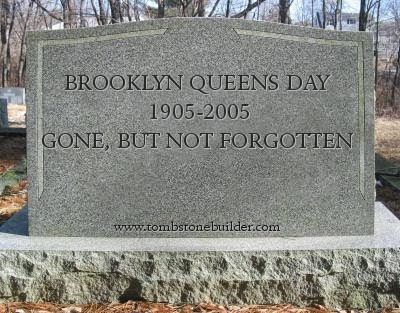 Rest in peace, Brooklyn Queens Day. We miss you. And though the supervisors won't admit it, they probably miss you too. Unless they're from Manhattan, the Bronx, or Staten Island.